Warm summers days and nights call for scrumptious, out of this world ice cream desserts and the Seattle area can easily fill your needs. Starting in Bellevue a favorite is Vivo53 located in Bellevue Square where you can indulge in layers and layers of sugary goodness topped off with brownies, lollipops and you name they have it. Closer to downtown Seattle is HardWok Cafe where they serve delicious Taiwanese eats but save room for dessert because their Honey Toast Encounter is to die for. Just south of downtown Seattle located in Olde Burien is Medzo Gelato Bar & Travel Cafe featuring world-class gelato and sorbet served with a twist. 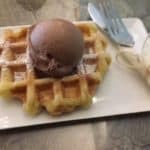 The Belgium Waffles made with pearl sugar caramelizes during cooking giving a unique sugary crunch, topped with your choice of gelato make for a delicious dessert. They also serve several spirited drinks like affogato, wine, hot chocolate and coffee.